In the July edition of the PCB Magazine you can read a guest article by Didrik Bech, CEO at Elmatica. He shares his thoughts and strategies around Compliance with DoD Regulations Including ITAR and DFARS. Are you unsure whether your are compliant or not towards DoD, these strategies might come in handy. The most important is to analyse internal and external factors in relation to procurement and compliance, and asking the vital: what, how, where and to whom? Governments regulate the import and export of defense grade material and equipment, to ensure that restrictions, laws and regulations are implemented and enforced. Governments and their domestic exporting companies are well aware, educated and receptive towards ensuring that export compliance is implemented and documented in their compliance programs. The challenge arises when the importing country has restriction in regard to compliance for the exporting country, and how the exporting companies in these countries are able to address these compliance demands in their local supply chain, consisting of domestic and foreign materials and components! 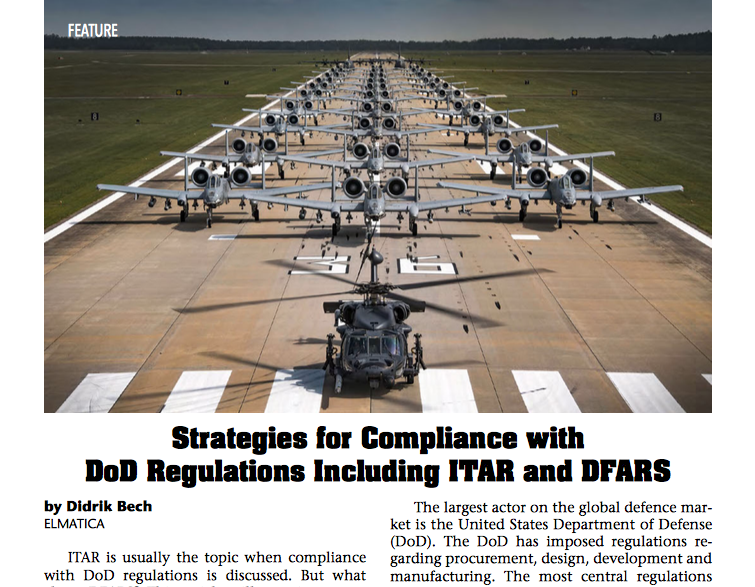 Why talk about ITAR when we should talk about DFARS?